If you’re making cake cupcakes for Super Bowl feasting, you can ice them with your team colors. McCormick has the recipes for all the NFL team colors. McCormick suggests adding the color to a 16-ounce can of white frosting, but if you have a picky palate, you might prefer to make your own buttercream or cream cheese frosting (here are the recipes). 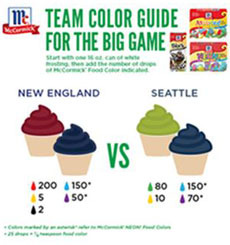 Both sets of team colors require regular food colors and a box of McCormick NEON! food colors. The New England Patriots red also requires a bottle of black food color. So get mixing and surprise your family and guests with something sweet, with our hopes that the day will be even sweeter when your team wins. Mix your team colors. The asterisks * indicate neon colors.Photo courtesy McCormick. Spoon and Swirl Formation: Place one tablespoon of each color frosting on a cupcake, then spread and swirl the frosting with a small knife or spatula. Pastry Bag Conversion: Place both colored frostings side-by-side in a pastry bag and squeeze them out together. The difference between frosting and icing is that icing is made with confectioners sugar’ (also called icing sugar and 10x sugar). But the two words are used interchangeably by those not aware of this nuance.